Tobacco harm reduction is one of the most important issues to the Risk Analysis Division. We believe that proper (limited) regulation of reduced risk products such as e-cigarettes and snus, a type of smokeless tobacco, can save more lives than any new tax, warning label, or ineffective “public service” campaign. I often have to remind my colleagues that changing minds, especially on a topic as emotionally charged as this one, takes time. Gains will come, but only incrementally. Yesterday, after writing a letter about the issue to a group of Massachusetts legislators, I got to remind myself how those gains can go unnoticed. I’m writing in reference to HB1943 – An Act to study the use of harm reduction, sponsored by Rep. Finn, to be considered at your upcoming meeting. As a policy analyst on science-based policies to reduce the deadly toll of smoking tobacco, I am pleased that your committee will deliberate this issue. I have long advocated that regulators consider the use of harm reduction as a strategy for reducing cigarette smoking in the Commonwealth, thereby reducing death, disease and health care costs associated with the use of cigarettes. I am also pleased that Congress has incorporated the concept of harm reduction in the Family Smoking Prevention and Tobacco Control Act, which gives the Federal Food and Drug Administration authority to regulate tobacco products. 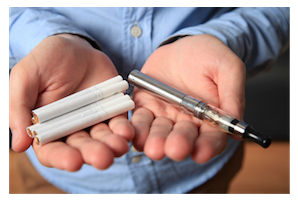 In addition, together with the National Institutes of Health, the FDA is in the midst of a national longitudinal study called Population Assessment of Tobacco and Health (PATH), which includes multiple evaluations of how people are using e-cigarettes, to help better develop e-cigarette regulations based on real-world usage. Given the major financial resources and scientific expertise being deployed by the FDA, I would respectfully suggest that the commonwealth rely on the federally funded science, rather than requiring the Massachusetts DPH to do its own, more limited study. “…if at the end of the day people are smoking for the nicotine, but dying from the tar, then there’s an opportunity for FDA to come up with what I’ve been calling a comprehensive nicotine regulatory policy that is agency-wide and that is keyed to something that we call the continuum of risk: that there are different nicotine containing and nicotine delivering products that pose different levels of risk to the individual. Right now the overwhelming majority of people seeking nicotine are getting it from the deadliest and most toxic delivery system, and that’s the conventional cigarette. But if there is a continuum of risk and there are less harmful ways to get nicotine, and FDA is in the business of regulating virtually all of those products, then I think there’s an extraordinary public health opportunity for the agency to embrace some of these principles and to figure out how to incorporate it into regulatory policies. This principle, together with the FDA’s scientific and population based evaluations of e-cigarettes, will be valuable tools for the Commonwealth as it considers appropriate regulations to incorporate the use of harm reduction as a strategy for reducing cigarette smoking. Now, the reflection. A liberal Massachusetts legislator authored a piece of legislation encouraging the state’s health department to study how tobacco harm reduction could save lives. I supported a 2012 Indiana law that required the state to take into account the benefits of “tobacco harm reduction” when making policy. Who would have thought, that in 2015, now even democrats in Massachusetts are considering endorsing the idea as well. While I don’t think the Massachusetts legislation is a good use of resources at this point in time, nonetheless, it is worth noting as a marker of our incremental progress.